Objective Anaemia is associated with higher mortality among patients with non-stroke cardiovascular conditions; less is known regarding the relationship between anaemia and mortality among patients with acute ischaemic stroke. Methods Medical records were abstracted for n=3965 veterans from 131 Veterans Health Administration facilities who were admitted with ischaemic stroke in fiscal year 2007. Haematocrit values within 24 hours of admission were classified as ≤27%, 28%–32%, 33%–37%, 38%–42%, 43%–47% or ≥48%. Multivariate logistic regression was used to examine the relationship between anaemia and in-hospital, 30-day, 6-month and 1-year mortality, adjusting for age, medical comorbidities, modified Acute Physiology and Chronic Health Evaluation-III and stroke severity. Impact factors were calculated to standardise comparisons between haematocrit tier and other covariates. Results Among n=3750 patients included in the analysis, the haematocrit values were ≤27% in 2.1% (n=78), 28%–32% in 6.2% (n=234), 33%–37% in 17.9% (n=670), 38%–42% in 36.4% (n=1366), 43%–47% in 28.2% (n=1059) and ≥48% in 9.1% (n=343). Patients with haematocrit ≤27%, compared with patients in the 38%–42% range, were more likely to have died across all follow-up intervals, with statistically significant adjusted ORs (aORs) ranging from 2.5 to 3.5. Patients with polycythaemia (ie, haematocrit ≥48%) were at increased risk of in-hospital mortality (aOR=2.9; 95% CI 1.4 to 6.0), compared with patients with mid-range admission haematocrits. Pronounced differences between patients receiving and not receiving blood transfusion limited our ability to perform a propensity analysis. Impact factors in the 1-year mortality model were 0.46 (severe anaemia), 0.06 (cancer) and 0.018 (heart disease). Conclusions Anaemia is independently associated with an increased risk of death throughout the first year post stroke; high haematocrit is associated with early poststroke mortality. Severe anaemia is associated with 1-year mortality to a greater degree than cancer or heart disease. These data cannot address the question of whether interventions targeting anaemia might improve patient outcomes. We used data from the Veterans Health Administration (VHA) to determine whether an association between baseline haematocrit and mortality exists throughout the first year post acute ischaemic stroke, and to assess the contribution of low and high haematocrit values to mortality during this time period, while controlling for burden of medical comorbidities and stroke severity. Given that the presence of lower measures of red blood cell volume was associated with greater mortality in prior work,1 10 we investigated whether finer tiers of haematocrit were associated with even higher mortality.1 Furthermore, we conducted a propensity analysis to understand whether receipt of blood transfusion among patients with anaemic ischaemic stroke affected postevent outcomes. The VHA Office of Quality Performance and the Veterans Affairs (VA) Stroke Quality Enhancement Research Initiative collaborated to conduct the first national VHA study of inpatient stroke quality. The study design and primary findings are reported elsewhere.20 In brief, VA administrative data were used to identify a study population of veterans (n=5721) who were admitted to a VA Medical Center (VAMC) in fiscal year 2007 (FY07) with a primary diagnosis of acute ischaemic stroke. A sample of 5000 medical records were selected; these included all cases from small-volume centres (≤55 patients) and a random sample of 80% of veterans at high-volume facilities (>55 patients in FY07).20 Patients were excluded if they were admitted for elective carotid endarterectomy, for postacute ischaemic stroke rehabilitation or were already admitted for a non-stroke condition when the ischaemic stroke occurred, leaving a final sample of n=3965 veterans from 131 VAMCs for whom full chart reviews were performed. In our current analyses, patients were also excluded when haematocrit laboratory values within 24 hours of acute stroke admission were unavailable (n=94), or when we found inconsistent death dates (n=6). Additional exclusions were based on limited sample size and included women (n=95) and patients who received intravenous tissue plasminogen activator (n=32). The final analytic sample included 3750 veterans. Date were collected through retrospective chart review of medical records using remote electronic record data only (ie, no paper records were used). Chart reviews were performed by abstractors from the West Virginia Medical Institute who were especially trained for the study. Among the 307 data elements, 90% had an interobserver agreement ≥70% (please refer to online supplementary 1 for a representative sample of select covariates). Data collected for this study included demographic factors, medical comorbidities (eg, medical history, Charlson Index),21 stroke severity score (as measured by the retrospective National Institutes of Health Stroke Scale (NIHSS))22 and admission data (eg, vital signs, medication, laboratory tests, active medical conditions). Race/ethnicity data were obtained from the VHA’s Functional Status and Outcomes Database (FSOD), and supplemented by the VHA inpatient/outpatient files and the Centers for Medicare and Medicaid (CMS) if race/ethnicity was missing in the FSOD. The primary outcome of interest was all-cause mortality, as measured from the VA Vital Status File (VSF), containing dates of deaths from all VA beneficiaries. Death information in the VA VSF originates from a variety of VA and non-VA sources (eg, CMS). The VA VSF is relatively complete and accurate when compared with information contained in the National Death Index.23 We examined in-hospital, 30-day, 6-month and 1-year mortality. The primary dependent variable was haematocrit values within 24 hours of hospital admission, prespecified as an ordinal variable based on prior research (not involving the ischaemic stroke population) using categories of ≤27% (severe anaemia), 28%–32% (moderate anaemia), 33%–37% (mild anaemia), 38%–42% (mid-range; referent), 43%–47% (mid-range) and ≥48% (polycythaemia).2 Haematocrit was not dichotomised as anaemia based on the WHO criteria (ie, haemoglobin <13.7 g/dL in men and <12.6 g/dL in women),19 given previously reported non-linear associations between mortality and anaemia in non-stroke conditions1 2 24 and ischaemic stroke.6 9 11 We were unable to characterise the type of anaemia (eg, iron deficiency, anaemia of chronic disease) with the available data. All statistical analyses used SAS V.9.2. We conducted bivariate analyses to describe the demographic and clinical characteristics of the study sample across each of the six categories of haematocrit, and we assessed differences using χ2 tests for categorical variables and analysis of variance tests for continuous variables. Multivariate logistic regression models were used to examine the association between haematocrit and mortality, after adjusting for covariates. A ratio of 10 outcome events per variable was maintained during model construction.27 28 A p value of <0.05 was used to demarcate statistical significance. The final multivariate logistic regression models included confounders selected a priori and identified in bivariate analyses as important predictors of mortality. The final mortality models included age (in 10-year increments), medical history of heart disease, cancer, chronic obstructive pulmonary disease (COPD), kidney disease requiring dialysis and atrial fibrillation, and admission hypoxia (oxygen saturation <90%), pneumonia and thrombocytopaenia (platelet count <100 cells/mm3),26 modified APACHE-III (as a measure of acute severity of disease), Charlson Index (as a measure of chronic disease comorbidity) and NIHSS (as a measure of stroke severity). No adjustments were made for multiple comparisons. As missing data were rare, imputations were not made for missing data. Adjusted ORs (aORs) and 95% CIs are presented. For each regression model, discrimination (C-statistics) and calibration (Hosmer-Lemeshow goodness of fit (HLGOF)) statistics were calculated to gauge model performance and fit, respectively.29 30 Finally, survival curves were calculated using the Kaplan-Meier method and were compared using log-rank statistics. Impact factors were calculated to make a standardised comparison between each category of haematocrit, medical comorbidities and NIHSS, and their contribution to mortality throughout the first year post stroke (online supplementary 2).29 30 To assess the contribution of blood transfusions on risk of mortality, a propensity analysis was conducted. The mean age of n=3750 veterans in the study was 67.9 years, and 67% were white. The distribution of haematocrit categories at admission (table 1) included approximately 2% with severe anaemia (haematocrit ≤27%) and 9% with polycythaemia (haematocrit ≥48%). The bivariate relationship between haematocrit levels and demographic, clinical characteristics and mortality is shown in tables 1 and 2. 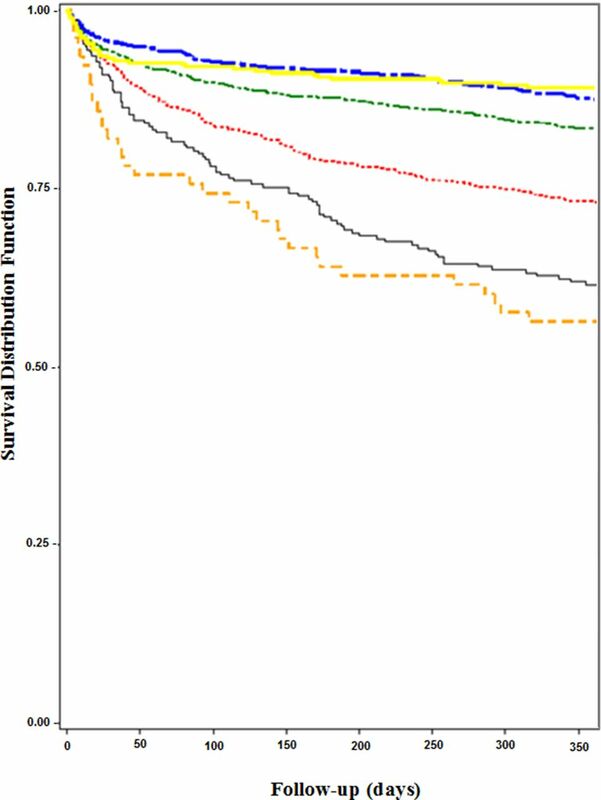 Kaplan-Meier curve demonstrating 1-year survival by admission haematocrit for men with ischaemic stroke. Tiers of haematocrit include ≤27% (orange) (severe anaemia), 28%–32% (grey) (moderate anaemia), 33%–37% (red) (mild anaemia), 38%–42% (green) (referent), 43%–47% (blue) and ≥48% (yellow) (polycythaemia). Severe anaemia was associated with the highest mortality, beginning during the index ischaemic stroke hospitalisation, whereas moderate and mild anaemia were associated with increased mortality by 6 months after hospital discharge. Polycythaemia was associated with mortality only during the index hospitalisation. Blood was transfused in n=73 (2.0%) of patients at admission; n=57 (78.1%) occurred in patients with haematocrits <38% (table 1). Patients receiving a blood transfusion were more likely to die during the hospitalisation (17.8% vs 3.3%), at 30 days (32.9% vs 7.3%), 6 months (49.3% vs 13.8%) and 1 year (61.6% vs 18.0%) (p<0.0001 for all). In conducting a propensity analysis, given the pronounced differences between patients who did and those who did not receive blood transfusions, a stable propensity model could not be developed. Higher haematocrit levels have previously been associated with increased stroke risk, especially haematocrits >45%.10 31 32 Among patients with first ever stroke, the literature reports that women were more likely than men to have haematocrits >50% (6.6% vs 2.8%; p<0.0001). After adjusting for age, vascular risk factors, chronic atrial fibrillation, the presence of total anterior circulation infarction and haematocrit categories, haematocrits 46%–50% and >50% independently predicted 28-day mortality in women, but not men.8 Others reported that patients with ischaemic stroke in the highest haemoglobin quartiles (≥15.3 g/dL in men and ≥14.2 g/dL in women) had higher 1-month and 1-year mortality rates than patients in the middle quartiles.11 Elsewhere, higher inpatient and 1-month mortality was noted among patients within the highest quintile (≥15.6 g/dL).10 The authors postulated that higher haemoglobin values could be seen in dehydration and COPD. In our cohort, admission creatinine and blood/urea/nitrogen were higher than the normal reference range, possibly reflecting hypovolaemia at the time of presentation, whereas COPD occurred more often in patients with lower haematocrits. Anaemia may reflect the underlying health status of patients with stroke, given the advanced age and burden of comorbid illnesses that are seen in patients with stroke with anaemia compared with patients with more mid-range (38%–47%) haematocrit. Oxygen delivery to the brain is optimal at a haematocrit of 40%,33 and mid-range haematocrit has been associated with better stroke outcomes (eg, discharge to hospice vs inpatient rehabilitation unit; improved 3-month modified Rankin score).4 6 Across studies, anaemic poststroke patients with cardiac disease, malignancy, renal impairment, older age and worse stroke severity had higher mortality.3 5 7 9 11 Similar to these studies, we found older age, higher comorbid disease burden and worse stroke severity occurred commonly among patients with lower haematocrits. Anaemia may confer increased mortality risk beyond its association with medical illness, perhaps through its influence on cerebral perfusion pressure and flow dynamics both to and within the ischaemic penumbra. Based on the current results and the extant literature, it seems prudent to evaluate patients with stroke for treatable causes of anaemia, and to minimise hospital-acquired anaemia during an acute ischaemia stroke admission. From the available data, haemoglobin augmentation strategies cannot be advocated for poststroke patients at this time.34 While haemoglobin augmentation strategies have been associated with favourable outcomes in patients with MI and CHF, in patients with chronic kidney disease, diabetes and anaemia, darbepoetin alfa administration was associated with increased stroke risk (5.0% vs 2.6%, HR: 1.92; 95% CI 1.38 to 2.68, p<0.001).33 Mathematical modelling data support a transfusion threshold of haematocrit <30% among patients with acute ischaemic stroke.13 When applying this transfusion threshold to our cohort, 180 (4.8%) patients would have received a blood transfusion. However, receipt of blood transfusion during a hospitalisation for acute ischaemic stroke was neither correlated with improved in-hospital nor 90-day mortality.35 As there were such pronounced differences between patients with anaemia who did and did not receive blood transfusion, a stable propensity model could not be generated.35 Additional work is required to evaluate whether interventions that treat anaemia or polycythaemia reduce poststroke mortality. Recognising the presence and importance of a non-linear, U-shaped association between admission haematocrit and all-cause poststroke mortality may have implications at both the patient level, regarding evaluation and management, as well as at the facility level, when understanding risk-adjusted outcomes at discrete time points.37 Additional work is required to understand whether intervening on anaemia via haemoglobin augmentation strategies (eg, blood transfusion) and polycythaemia improves poststroke trajectories of care.
. Relationship of initial hematocrit level to discharge destination and resource utilization after ischemic stroke: a pilot study. Arch Phys Med Rehabil 2003;84:964–7.
. Pathophysiology, Diagnosis, and Management. 5 ed, 2011. Organization WH. Nutritional Anemia: a report of a WHO Scientific Group - World Health Organization Technical Report Service.
. The Quality of VA Inpatient Stroke Care, FY2007: Final National and Medical Center Results, VHA Office of Quality and Performance (OQP) Special Study, 2009.
. The APACHE III prognostic system. Risk prediction of hospital mortality for critically ill hospitalized adults. Chest 1991;100:1619–36.
. Principles of Medical Statistics. 1 ed. London: Chapman Hall/CRC 2001.
. Cerebral Blood Flow: Mechanisms of Ischemia, Diagnosis, and Therapy. 1 ed. New York: Springer, 2002. Contributors JJS: study concept and design; analysis and interpretation. LJM, BJF: analysis and interpretation. JC, LSW: study concept and design; critical revision of the manuscript for important intellectual content. DMB: study concept and design; analysis and interpretation; critical revision of the manuscript for important intellectual content. Funding This work was supported by the Department of Veterans Affairs, VHA, Office of Quality and Performance, and Health Services Research & Development Service Quality Enhancement Research Initiative Service Directed Project 12-178 and Career Development Award 11-262, and the Department of Veterans Affairs, Health Services Research & Development, Stroke Quality Enhancement Research Initiative (QUERI) Rapid Response Project 09-184. The views expressed in this article are those of the authors and do not necessarily represent the view of the Department of Veterans Affairs. Ethics approval The VA Institutional Review Boards in West Haven, Connecticut, and Indianapolis, Indiana, approved this study.